This lesson provides interesting hurricanes facts for kids. Read through the lesson to know more facts about hurricanes. Hurricane is the name given to violent storms that originate (begin) over the tropical or subtropical warm waters of the Atlantic Ocean, Caribbean Sea, Gulf of Mexico, or North Pacific Ocean. A hurricane is a powerful storm with pouring rains and strong winds. Hurricanes start over the ocean. They form over warm water. Hurricanes grow stronger if they stay over warm water. But they grow weaker over cold water. In the western Pacific Ocean, hurricanes are called. Hurricanes near Australia and India are called tropical cyclones. When the air is much warmer than the surface of the ocean over the tropics, the winds pick up huge amounts of energy and water vapour as they rush towards the land. When the wind speed reaches 120 kph (120 kilometers per hour) a hurricane is created. Learn hurricanes facts about their characteristics. 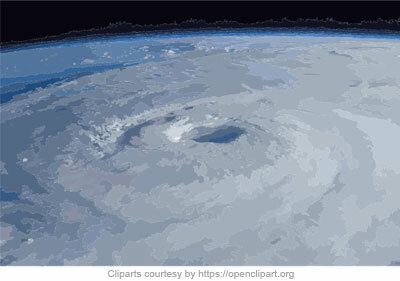 A hurricane is a whirling (rotating/ spinning/ turning) mass of air. It is about 900 km wide and 10 km high. The mass of wind and clouds spirals upwards inside a hurricane. Heavy rain pours down from these clouds. There is a clear patch in the centre of a hurricane. 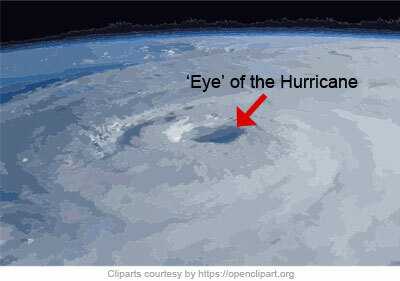 It is called the ’eye’ of the hurricane. A hurricane takes several days to travel from the ocean to the land. Weather scientists called Meteorologists watch for hurricanes at sea during summer and autumn. They use radar, weather satellites, and instruments in the sea. They try to figure out which way the hurricane is traveling. Sometimes special airplanes fly into the hurricane to make measurements. Meteorologists warn people when a hurricane is headed their way. They tell people to leave the area. Predicting hurricanes can save many lives. 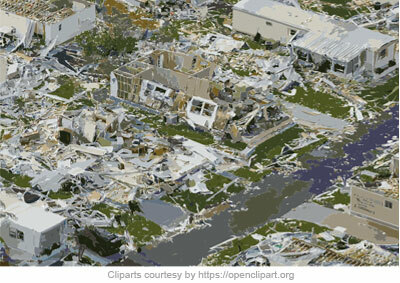 Learn hurricanes facts about their destruction. A hurricane lasts for a week or two. Hurricanes produce massive amounts of rain. Some hurricanes head for land. Hurricanes can do a lot of damage if they come up on land. Hurricanes push up huge waves and cause serious flood damage. Boats are lifted out of harbours. Hurricane winds uproot trees, destroy houses and buildings, lift and snap off vehicles and telephone poles. Many people are killed because there is only a little chance of survival. Hurricane damage occurs mainly on the coast and on island. Hurricanes grow weaker the farther inland they go. The strongest hurricane of the 20th century was Hurricane Gilbert. It hit the island of Jamaica and parts of Mexico in 1988. One of the most destructive hurricanes in recent history was Hurricane Mitch, which killed about 18,000 people in Central America in 1998. Another destructive Hurricane, Katrina, happened in 2005. Katrina killed about 1,300 people. It destroyed tens of thousands of homes in Louisiana, Mississippi, and Alabama. Also, read facts about tornadoes.